G0od morning everyone - it's Jeanne here! 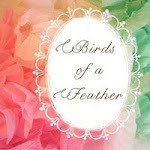 I hope you have been able to take advantage of all the fabulous kits the gals are selling in their Etsy shops and web boutiques. I must say I am amazed by the superb talents of the artists here at Joli Paquet. If you haven't had a chance to check them out yet be sure to do it soon before all the kits sell out and are gone forever! Today is my turn to share something wonderful and yummy with you all, so let's get started! This is an easy recipe, but it tastes like a million bucks. I made hundreds of these a few weeks ago for my daughter's wedding and they were such a big hit that I'm thinking of making more of them for the holidays. Maybe you would like to try them too! They make wonderful hostess gifts as well as stocking stuffers. I'll even show you how you can package them for the holidays! 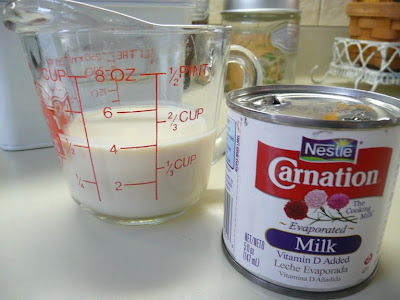 First lets, make the truffles - Start with 1/2 cup evaporated milk. Pour into a heavy saucepan. 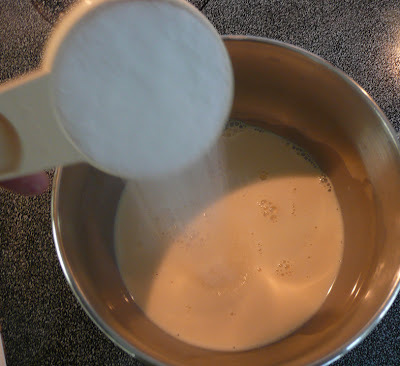 Combine with 1/4 cup granulated sugar. Bring to a full rolling boil over medium heat, stirring constantly. Boil for 3 minutes. 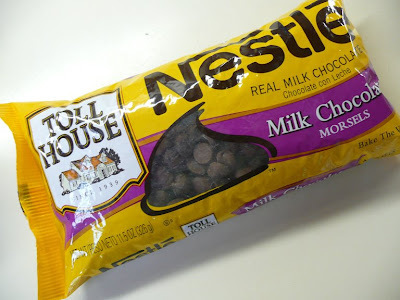 Remove pan from heat and stir in one 11.5 oz package of milk chocolate morsels. 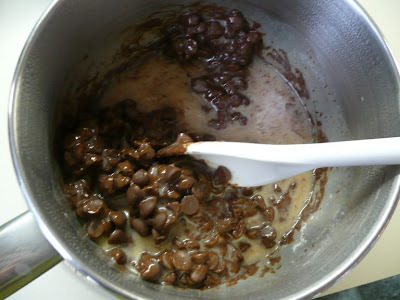 Stir vigorously and quickly so that the morsels melt completely and you don't end up with a lumpy mess! 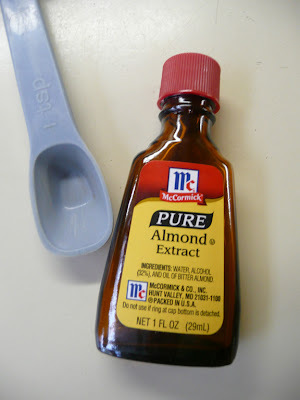 Now it's time to stir in 3/4 teaspoon pure almond extract. Mix well to combine. 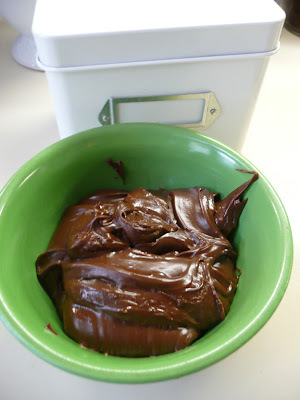 Transfer chocolate mixture to a small bowl and refrigerate for 1.5 - 2 hours. 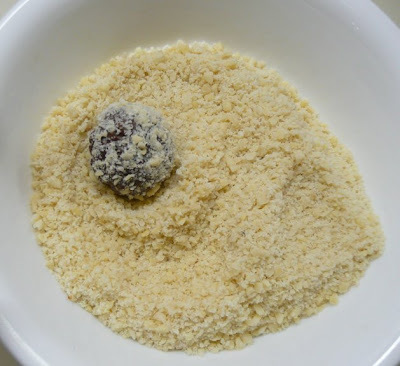 While chocolate is chilling, finely chop 1 cup sliced almonds in a food processor. 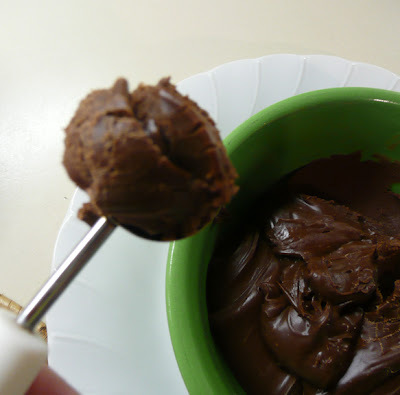 When chocolate is finished chilling, use the large side of a melon baller and scoop up chocolate. 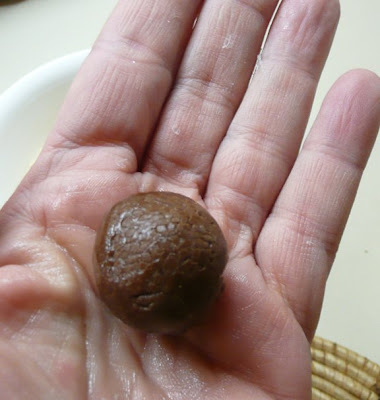 Roll into a smooth ball in your hands. 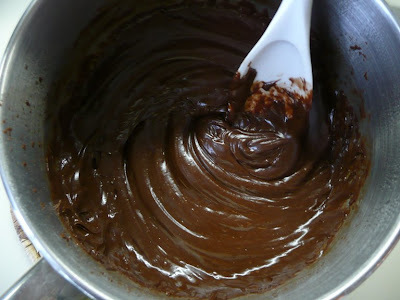 Then roll the ball of chocolate into the chopped almonds. 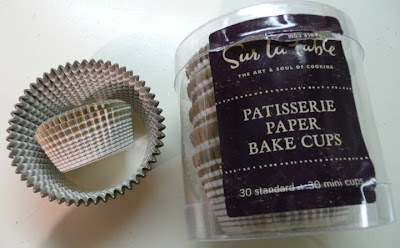 Place on waxed paper lined cookie sheet and refrigerate until set. 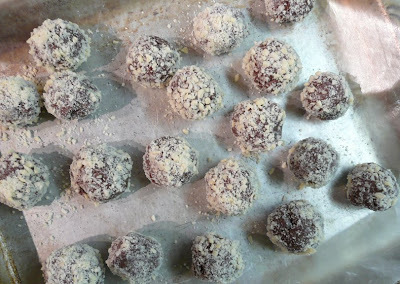 After the truffles are sufficiently chilled, you can place them into paper candy cups. These come in a wide variety of colors and patterns and are available practically everywhere from grocery stores to craft stores to specialty kitchen supply stores. I like the ones pictured below from Sur la Table. You also may want to wrap the individual truffles in foil to keep them fresh. Sur la Table sells some made especially for candy and Michael's also sells packages of gold and silver wrappers in the cake decorating aisle. Now it's time to package these goodies to give as gifts. This is the part that I love to do! I have a "thing" for detail in packaging. You can buy 2-inch square truffle or favor boxes at party stores or paper supply stores. I got mine at a wedding supply company online. Believe me after planning a wedding, I am an expert on these kinds of things! The boxes usually come in packages of 25. I prefer the 2-piece type with separate lids, as they are less flimsy than the one piece type. 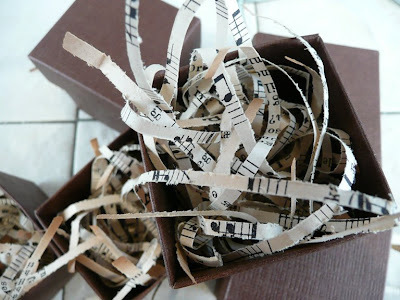 To fill the boxes and cushion the truffles, you can use regular paper shredd that you can buy in craft stores. 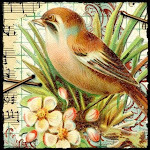 I painstakingly shredded vintage sheet music by hand using a paper cutter for my filling. If you happen to have an electric paper shredder that still shreds in strips (many of them are cross-cut types now) you can use that and save yourself hours of work, but I found many of those to cut the paper too wide for my taste. 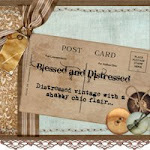 I have purchased this type of paper shred in the past at a couple different shops on Etsy, like this one here. Whatever you choose to fill your boxes with is fine. To decorate the top of the truffle boxes, I used a 2-in scalloped edge circle punch to cut circles out of red holiday paper and adhered it to the box top with a glue stick. Then I layered an eyelet seal on top of the paper circle. These particular seals are from the Martha Stewart Craft line and were purchased at Walmart. Using an old piece of millinery or silk flowers or a glittery floral pick like the one below, snip off some small leaves. If the leaves are too big, just use your scissors to cut smaller leaves out of the big ones. It doesn't have to be perfect! Then hot glue the leaves to the center of the box. Next add a tiny bow in a coordinating color. And after that, glue on a small charm, vintage earring, discarded bead or old button like I used below. Finish off with some dots made with Platinum Stickles (or German glass glitter, if you prefer) to add some sparkle! And Voila! You have party/hostess gifts or favors to give throughout the entire holiday season along with a delicious treat hidden inside! 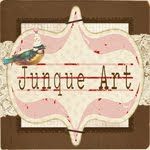 I hope you are enjoying all the tutorials and tips on the Joli Pacquet blog. It's so much fun to have a place to come all month long for holiday inspiration. Remember, we're only halfway through the month ~ we've got lots more to share with you! 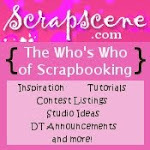 And don't forget to go check out all those wonderful KITS available for sale by clicking here. Thanks for sharing, Jeanne. 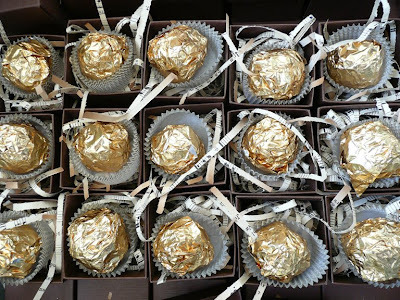 Yummy truffles packaged in equally yummy wrapping . . . what could be better?! I think you've given me a great idea on what to give the girls in my Bunco group at our C'mas dinner! 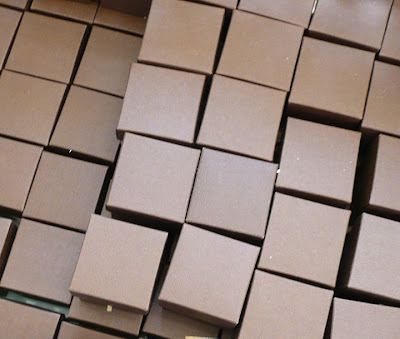 Would you mind sharing your online source for the boxes? I love the color. So much nicer than white. Oh YUMMY! These look so good. I'm not a great cook but I think I am going to try these for the holidays! 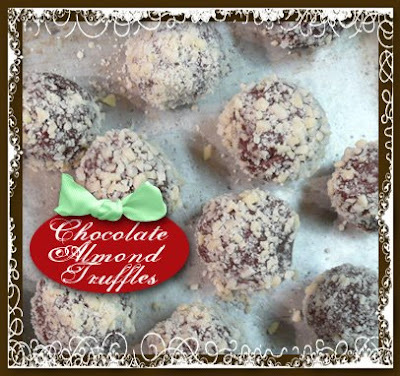 Oh Cindy, Anyone can make these truffles ~ the recipe is easy peasy! Yummy! Can't wait to make these. I think I'll have to hide them - from my hubby. Love the packaging too. It's all in the details. How sweet not only a yummy recipie but but the perfect packaging to wrap the little goodies up. Thanks for hosting this site am really enjoying everything. I LOVE making candy for Christmas. Can't wait to try this recipe. Just hope I'll be able to get them wrapped before my own family eats them up!!! Who wouldn't love to receive such a wonderful gift? Thanks for the recipe and idea! I am sooo going to make those! Thanks for sharing the recipe and giving all the packaging Ideas! I definitely need a scalloped punch.. and those doily seals look great on the tops! I'm enjoying Joli Paquet sooo much! These look GooD and EaSy, great combo for a tasty treat. I'll make these for our Thanksgiving getaway with friends. Thanks Jeanne. Jeanne, those truffles look delicious!!! i am making those for sure...i love the pretty boxes you made for them too!!! Very pretty boxes! Love the idea. YUMMY!!!!!! CAN'T WAIT TO TRY THESE ! Wow. What a wonderful tutorial--I can't wait to try these out! Right down to the delightful packaging (but I think I'll dig out my shredder--Jeanne, you are very dedicated to your craft when you are cutting paper shreds manually!) Thanks so much!